Last year in June, I was 14 years old and was at one of my first high school soccer open gyms. I was really excited and ready to go, as most freshman are. At the end, we we're walking back from the practice field and back up to the track. Earlier that spring, I had been doing hurdles in track and loved them with all my heart. There were some hurdles on the track, so I decided to run ahead and jump them. About the third one, I landed on my right leg and heard a loud popping noise come from my knee. I knew something had to be wrong. I went to the ER, they found nothing wrong, and so I proceeded to an orthopedic surgeon. The first one I went to said I had a completely torn ACL and also a torn meniscus. We scheduled surgery for 2 months later. My mom wanted a second opinion, so we went to another doctor. 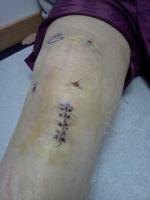 Once there, he told me I didn't need surgery, that my ACL wasn't completely torn at all. I was so happy that I could continue with my sports. I went through 2 months of physical therapy and got back into the swing of things. Everything was fine. I wore a brace, and I was as physical as ever. I wasn't afraid, which was a good thing. There were no problems for an entire year. I played part of my soccer season, my whole basketball season, and even did hurdles again in the spring (as a freshman I got sixth in the ITCL). We're almost done with my sophomore year of soccer. But, a couple weeks ago we were playing a game and the field was very uneven. I went to do a goal kick, still wearing my brace, and as I landed, that evil pop noise came from my knee and I went down. I was crying and the athletic trainer came over. The pain soon stopped and I went back in. Well, my knee felt a lot weaker and the pain didn't go away as soon as I thought. So, I am going to go to another doctor November sixth to plan surgery sometime next month. I'm really scared and freaked out. Is there anything I could do to prepare? How bad is the pain? Hope this helped and hope I can get some feedback! Sorry guys! I was trying to add links to your individual stories within the comments and somehow messed up the code and now the page is displaying weird. I am contacting support to get it fixed, but keep posting!